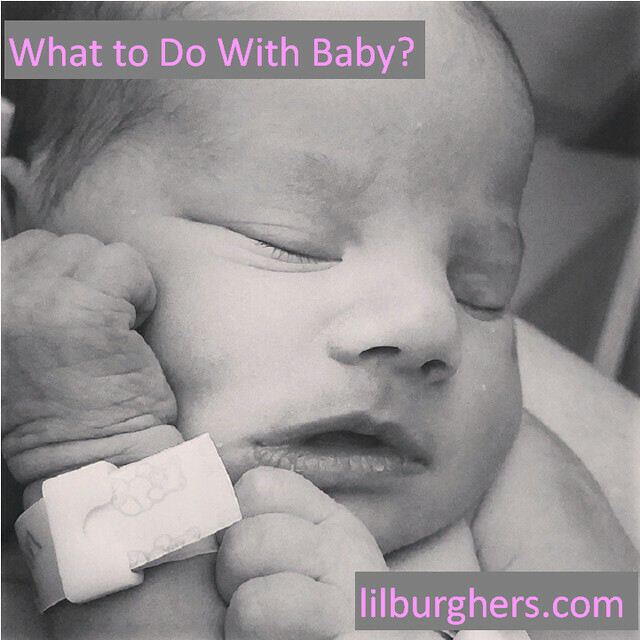 What To Do With Baby? I Have Newborns. Now What? You’ve waited nine long months (ten, really) to welcome your ‘lil bundle of joy. They are finally here and you’ve gotten used to the fact that you are feeding around the clock, changing diapers every hour, and not getting any sleep. There are a few lucky minutes in the day when you both are not sleeping and you’ve sang every song you can think of. What do you do now? Here are a few ideas based on my experiences as a new mom. Take a walk. Show baby your neighborhood. This will be good for you and them. Talk about the things you see – colors, trees, animals, neighbors. You might feel like you are talking to yourself, but you are actually helping baby learn and grow. Allow baby to have some tummy time. This will work their muscles and give your arm muscles a little break. Skype or FaceTime with relatives who live in another state. Let them get to be part of baby’s life, even if from a distance. Read books, or go to a library story time. The love of learning starts at an early age. Bonus? You might just meet other parents who are running around like zombies. Put on a puppet show. If you have some stuffed animals, use them to tell your baby a story. Baby massage. Get some lotion and give baby a mini massage. Talk to baby about the parts of their body and what they will use them for as they grow. Nap outside. Grab a blanket and a big umbrella and let baby take their nap outside. (No sunscreen on little ones, so be careful how much sun exposure they get.) You’ll both benefit from the fresh air. Have a dance party. Introduce baby to some of your favorite classic songs. Slow dance or let her try the Macarena in your arms. Talk to baby. Tell baby all about their world. How did they come into your life (because every family story is unique, tell baby what makes their entry special)? Tell them about their siblings or aunts and uncles. Talk them through you making their favorite recipe. Tell them about the things you’ll be doing when you go back to work (or what your partner does when they go to work). Simply snuggle. Just relax and enjoy this time with baby. People mean it when they say “they won’t be like this for long”. This is your time to just be still and quiet. Get to know the newest love of your life and enjoy it. This entry was posted in Parenting and tagged Baby. Bookmark the permalink.